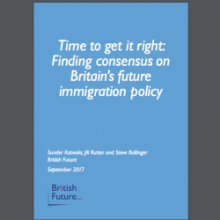 In Time to get it right: Finding consensus on Britain’s future immigration policy, British Future analyses the 2017 General Election and what it means for the main political parties, before casting forwards to examine one of the key issues that the new Government will need to address: designing an immigration system for after Britain leaves the European Union. Crucial to getting that right will be securing public confidence in a post-Brexit immigration system, and the report looks in detail at public attitudes to immigration after election – and finds a striking degree of consensus across political and referendum divisions. Time to get it right outlines a new post-Brexit immigration system which reflects this public consensus, combining greater UK control over low-skilled migration while allowing skilled migrants to come to the UK as before. Polling from ICM finds that nearly two-thirds of the public (63%) would support such an approach to immigration after Brexit.